Physiology is a scientific discipline that underpins medical practice, healthcare and the assessment of human performance. This degree provides a solid grounding in the understanding of normal body function at the level of cells, tissues, organ systems and the whole-body. Why study BSc Medical Physiology at Middlesex University? The main focus of the degree is to give you a theoretical and practical understanding of cardiovascular, musculoskeletal, nervous and respiratory systems, with the emphasis on the diagnosis of disease, the assessment of human fitness, and human performance under challenging environmental conditions. You will also learn a wide range analytical techniques used in the clinical setting and in research when assessing body function and acquire the knowledge and skills to record securely store and analysis anthropometric and physiological data. It is an ideal course for those with an interest in understanding how the human body functions in health, under extreme environmental conditions and in disease. You will learn from a dedicated team of academics and clinical practitioners, who will use a wide range of active learning styles, including enquiry-based, laboratory-based or problem-based activities. What will you study on BSc Medical Physiology? Your studies will help you to acquire a sound understanding of the human physiology and how body’s physiological systems respond to extreme environmental conditions, such as extreme ambient temperatures and space. In Year 1, you will review the basic sciences, covering cell biology, anatomy, human physiology and the physics behind the instrumentation and equipment used to record body functions. You will also learn about current trends and potential careers in the field of medical physiology. In Year 2, you will explore common cardiovascular, respiratory and nervous systems, covering relevant anatomy, cell biology, genetics, physiology, pathophysiology, and pharmacology and therapeutics. You will also learn techniques used to assess the functioning of the cardiovascular, respiratory and nervous and musculoskeletal systems and acquire research and employability skills. 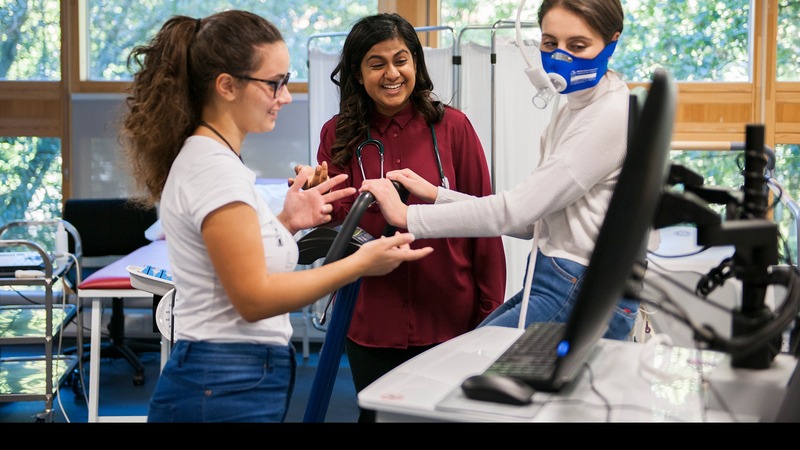 Finally, in Year 3 you will explore the techniques used to assess the functioning of the cardiovascular, respiratory, nervous and musculoskeletal systems in much greater depth, with an emphasis on diagnostics and assessment of human performance. The effect of prolonged exercise, extreme ambient pressures and temperatures, stress, high altitude and the space environment on human performance will also be studied. You will be able to carry out your own research in an area of physiology. Upon successful completion of this degree you will have gained an awareness of the causes of and pathophysiology of diseases of the heart, lungs, musculoskeletal and the nervous systems, and have developed the practical skills and knowledge to assess the health status of an individual and to evaluate human performance. You will have an ability and understanding in recording, storing and analysing anthropological and physiological data, as well as an understanding of the importance of research in the advancement of scientific knowledge and evidence-based practice. Independent, critical and creative thinking. This module explores the cell as the basic functional unit of life investigating the structure and function of cell components and introducing the cell cycle and the biology of disease. Concepts of evolution and the principles of inheritance are explained at the molecular level. This module aims to provide you with the knowledge and understanding of human anatomy and physiology required to underpin your future learning. The unifying theme of homeostasis is used to show how a healthy structure and function are maintained and how failures of homeostasis can result in disease. This module begins the process of developing the skills required by employers, to become an autonomous and lifelong learner and a scientist. You will also have the forum to explore current trends in medical physiology. The module introduces the basic principles of both physics and mathematics that are related to healthcare. You will gain a range of the mathematical and statistical skills that underpin the practice of healthcare science. This module aims to provide an introduction to the physical and mathematical principles that underpin the concepts of instrumentation used in the Neurosensory Sciences and measurements. The module aims to provide you with the skills necessary to plan, implement, analyse and report project-based work, with the focus on preparation for the final year project module. You will develop core research skills fundamental to a scientific research design, irrespective of discipline. Specific research skills include analytical techniques appropriate to individual programme requirements. The module aims to provide you with knowledge and understanding of principles and properties of measurement techniques used in carrying out physiological measurements. This module aims provide you with a solid foundation in neurophysiological recording systems, theory and practice of electroencephalography (EEG) and visual evoked potentials (VEP). This module will provide you with an understanding of cardiovascular and respiratory systems from a molecular to a system level in health and disease. Additionally, you will gain an appreciation of the theory and practice of monitoring techniques used to assess cardiovascular and respiratory systems. This module will give you the practical knowledge and skills of electroencephalography (EEG), electromyography (EMG) and nerve conduction studies (NCS) used to diagnose neurological and neuromuscular diseases and used in neurophysiological research. Additionally, you will gain an insight into interpreting test results. This module will provide you with an understanding of both the integrative physiological responses or adaptations to, and the limits of, human performance under challenging environmental conditions. Additionally, you will gain an appreciation of the theory and practice of monitoring techniques used to assess physiological changes induced by exercise or environmental stressors. This module aims to provide you with the knowledge and understanding required to safely contribute to the clinical exercise testing and interpretation of patients with heart diseases, pulmonary vascular diseases, peripheral arterial diseases, and muscle disorders. This module will build on the skills you have acquired throughout the course and in past modules. Further development of analysis, critical thinking and scientific literary style will be promoted. You will be enabled to pursue areas of individual interest in the subject area appropriate to your target award and will have the opportunity of gaining increased theoretical and practical knowledge in a chosen specialist field. Individual research experience will be gained in an area that may provide future employment opportunities. Personal responsibility for own learning through self-directed study and supervised preparation will be fostered. This is an integral part of the degree programme, furthering the development of skills in critical analysis and reflection. How is the BSc Medical Physiology taught? Individual projects will take place in the final year and all projects will be supervised by an appropriate academic and designed to help you develop your critical thinking and research skills. A range of online resources will be used, designed to support the teaching provided by academics and practitioners. Your knowledge and understanding is assessed by both summative and formative assessments, which include seminar presentations, written assignments including laboratory reports, portfolios, group project, dissertation, practical and theory examinations. We require A level, or equivalent level qualification in depth and size, at grade C or above in a science subject. If you have achieved a qualification such as a foundation degree or HND, or have gained credit at another university, you may be able to enter a Middlesex University course in year two or three. For further information please visit our Transfer students page. If you have relevant qualifications or work experience, academic credit may be awarded towards your Middlesex University programme of study. For further information please visit our Accreditation of Prior Learning page. For information about suitable international qualifications, please click here. If your international qualification is not listed at the website or you need more information, please contact an admissions advisor on 020 8411 5555 or click here to submit your enquiry online. You must have competence in English language to study with us. The most commonly accepted evidence of English language ability is IELTS 6.5 (with minimum 6.0 in all components). Visit our English language requirements page for a full list of accepted tests and qualifications. Please apply via UCAS using this course’s UCAS code B123. How can the BSc Medical Physiology support your career? Typical employers of medical physiology graduates include the armed forces, NHS, health and fitness industry, research centres and academic institutions and, medical device and pharmaceutical companies.